HEY! Looking for an ATV Cargo Box. ATV Rear Seat? Our best selling Kimpex, Wes and Tamarack boxes are on Sale! Kimpex, Tamarack & Wes Industries offer the best ATV Cargo accessories on the market! These fit perfectly on the back of your utility quad. We also offer our TheATVSuperStore.com exclusive "Lock & Go" system for Sportsman & Sportsman XP. With the exclusive kit you can install or remove you rear seat in a matter of seconds! Take a look below to see all the different options we offer. Remember at TheATVSuperStore.com we test & use what we sell. Our experience is that Kimpex, Tamarack & Wes have been the best accessories we have purchased for our ATVs. Any question just call us at 815-321-3888. Polaris Sportsman 1 up with ATV rear seat. Our Sportsman 500 HO with the American Made Titan Deluxe Lounger ATV Rear Seat. Please note: ATV cargo box seat not approved for passenger use. A Wes Deluxe Plus w/Heated Grips & Heated Seat! Here at TheATVSuperStore.com we test and use the ATV Cargo Box seats that we sell. 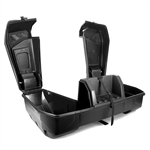 We have put these ATV Cargo Box and rear seats thought thousands of miles of trail testing. Feel free to give us a call at 815-321-3888 or drop us a email at TheATVSuperStore@gmail.com.